We are in New Mexico this week. We came to get our house ready to move into. So far we've done a lot of cleaning, scrubbing, and managed to prime and paint the living room. I was going through the kitchen cabinets and was surprised to find this crochet hook still in there. We received an answer to prayer this morning. We got an offer on our house! You may not remember but our house in Texas has been on the market fot 33 days now. We've been praying for a quick sell and a good offer and God delivered. We signed a contract today and should close in the next 45 days. So thankful that God still answers prayers. We will keep praying that the whole process goes smoothly and that we don't run into any major problems. Since I'm not at home and dont have a computer and wi-fi, I havent been able to visit you and return visits but I promise I will pay you all a visit when I get home later this week. I had to come to McDonald's to type this post on my Ipad. It was just too good of news and I couldn't wait to share it with all of you. I'm hosting a giveaway this week so be sure to leave a comment on my previous post to be in the drawing. Wonderful, exciting news, fingers crossed all will go well. Its nice to know that the previous owner had the same interests as you, as you say even better if you could find the yarn stash. Safe journey back. Congrats on the contract! You must be relieved. Good luck with sprucing up your new place. That book was a neat surprise! I'm happy for you and your family !!! That's fantastic news! :) Happy for you and that's a praise report too! :) The little hook in the cabinet is a nice surprise, I completely agree, a big bag of yarn would be awesome! Have a great day! Congratulations, that is wonderful. And the crochet hook is a very promising sign. Congratulations on getting an offer for your house and finding a little surprise in your new home! When my husband and I bought our house, the elderly couple who lived here and downsized, left us lots of wonderful things. It was so sweet of them! Oh Beca congrats! I'm so happy for you and how exciting. What a lovely little surprise that you found in your new home! It's like she already knew you were a crocheter. Good luck with everything. Such a wonderful surprise and an awesome blessing, Beca! I'm so happy to hear it. I pray the rest of your moving journey goes well. 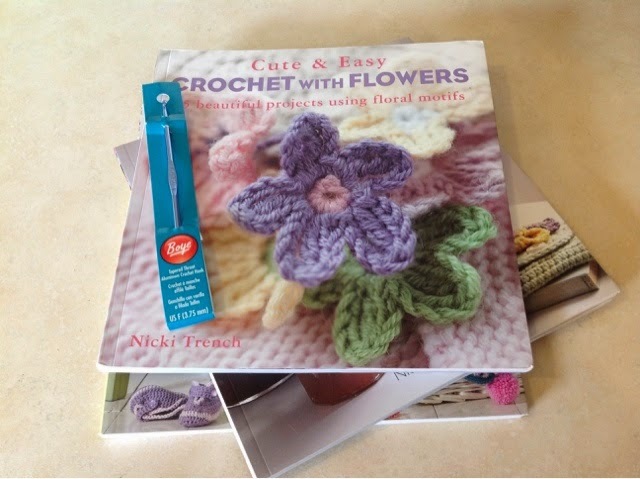 Wonderful news for you Beca and how lovely that you should find the little crochet hook in your new home too....it has to be a good sign! What a beautiful surprise! I hope your move goes well. Great news, congratulations on selling the house! Hello! I wanted to let you know that I really enjoy visiting your blog and I have nominated you for the Liebster award! Check out my blog entry at http://needlesandwool.blogspot.ca/2014/05/liebster-award.html to see the award!